Epipolar Consistency has been shown to be a powerful tool in calibration and motion correction for flat panel detector CT (FD-CT) and other X-ray based applications. The epipolar consistency conditions (ECC) apply to projection data directly and can be used to correct for 3D parameters without 3D reconstruction. The computation of an epipolar consistency metric is real-time capable for small sets of images and can be parallelized for large sets of images. This document briefly describes an algorithm to compute a metric for the epipolar consistency conditions (ECC) between to X-ray images. We assume that the reader is familiar with epipolar geometry  and has basic knowledge of X-ray physics and the Radon transform . We will briefly describe an improved version of the algorithm presented by Aichert et al. . Figure 1 Original X-ray images (before pre-processing) and their relative geometry. Figure 2 A projective line in two-space and its representation as angle and distance to the origin . Every pixel in these images represents an X-ray intensity, which can be transformed into an integral over absorption coefficients where is the function of X-ray absorption along the backprojection ray of the pixel with a distance to the source . Please see Figure 1↑, left, center, for two example X-ray images before preprocessing with several exemplary epipolar lines. Further, let denote the Radon transform of the thus transformed image with compare Figure 2↑. See Figure 3↓ for radon derivatives of the pre-processed images from Figure 1↑. Note that a line bundle forms a sinusoid curve in Radon space. 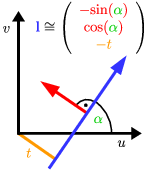 Figure 3 Derivatives of the Radon transforms orthogonal to the lines and . A large portion of the algorithm discussed in the previous section is linear. Our goal is to write it as a matrix multiplication by the vector . with and . With and we have and , respectively. The two lines are generally not orthogonal. 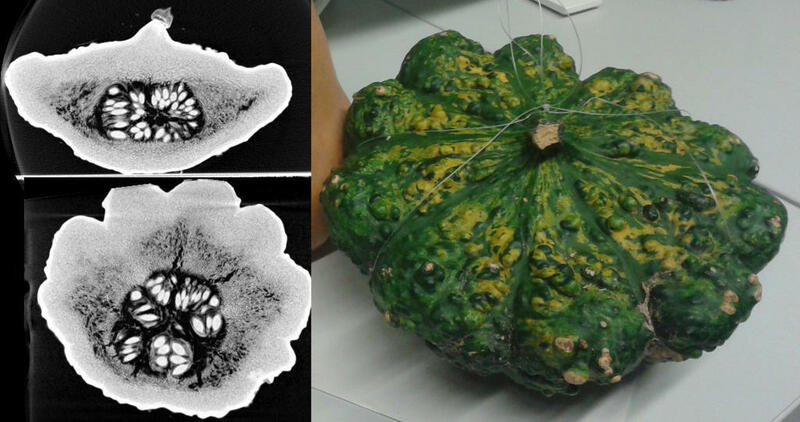 Figure 4 CT slices of the pumpkin phantom and a photograph. We provide two example data sets. A pumpkin as an example for an organic structure and a toy gun as an example of an artificial structure. We use NRRD as an image format and provide a C++ header-only library to load and save NRRD images. We recommend Fiji/ImageJ as an image viewer. For MATLAB/Octave, there exists a nice function to load NRRD files from Mathworks FileExchange, distributed under its own BSD license. All NRRD files contain a human-readable ASCII header. Our projection images contain a projection matrix (MATLAB-like format). In addition, there is a comment in the last line with the offset in bytes to the raw float data, followed by an empty line. # Offset to raw data:      570 bytes. By convention, we refer to the function , in words the “derivative in -direction of the Radon transform” as dtr, compare Figure 3↑. These dtrs have to be pre-computed from the projection images. We recommend to use our minimal working data set to get started quickly. For in-depth investigations, we provide you with two complete data sets of 15 images each, along with a Windows/CUDA binary to compute the Radon transform and tools to convert and edit NRRD files (see Downloads↓ Section). Please see the first lines in ecc_demo.m and adjust the paths to two input images as desired. Here, dkappa is arbitrarily chosen to be . Adjust this value to obtain a dense sampling of lines. The code in ecc_demo.m computes redundant values for both at the same time and is able to terminate early, when the lines no longer intersect the image. It also contains a lot of code for visualization. A brief version of ECC computation can be found in the file ecc_demo/ecc_compute_consistency.m . where is the angle between two homogeneous lines and the euclidian distance between a line and an image point. The same should hold for , and , respectively. Whether or is the limiting dimension depends on the location of the epipoles. If they are close to the image, a differential change in will affect more than , and vice versa if the epipoles are far away. One should choose adaptively for each pair of images. (1 hour for 11x11 versus 1 second for 501x501, plot shows detector shifts of +/-50 pixels). The octave source code including two example images. A. Aichert, M. Berger, J. Wang, N. Maass, A. Doerfler, J. Hornegger, A.K. Maier. Epipolar Consistency in Transmission Imaging. Medical Imaging, IEEE Transactions on, 34(11):2205-2219, 2015. James F. Blinn. A homogeneous formulation for lines in 3 space. ACM SIGGRAPH Computer Graphics, 11(2):237-241, 1977. T. Buzug. Computed Tomography: From Photon Statistics to Modern Cone-Beam CT. Springer, 2008. R. Hartley, A. Zisserman. Multiple View Geometry in Computer Vision. Cambridge University Press, 2004.